“Family quarrels are bitter things,” wrote F. Scott Fitzgerald. “They don’t go by any rules. They’re not like aches or wounds; they’re more like splits in the skin that won’t heal because there’s not enough material.” In her recently released family saga, Four Letters, author Diane Kasulis makes her publishing debut with a bittersweet story certain to resonate with anyone who has ever experienced estrangement with parents, siblings or their own children. Q: Your journey to become a published author undertook quite a circuitous route, starting with a college major in pharmacy and followed by stints in photography, sign painting, milking goats, and driving semi-tractor trailers from one coast to the other. Which of these pursuits do you feel was the biggest influence on your vision as a storyteller and the discipline it takes to stay with a project from start to finish? A: Everything I have done has had some impact on me as a storyteller. I have always tucked away experiences and emotions that might fit into a story one day. The biggest influence, however, has been from any job involving driving either over the road in a big truck or school bus driving. The reason for this choice is because when you are driving for hours, it gives you a lot of time to think, and construct a story. When writing Four Letters, I was able to visualize the chapter I was writing that day, in my mind as if I was watching a movie. Once I had the scene perfected, I went home and just wrote it down. As the story progressed in my mind, it became easier to record it from chapter to chapter and scene to scene. The hardest thing was just beginning. Q: Were you an avid reader when you were growing up? A: I remember doing a fair amount of reading growing up, mostly the classics such as Charles Dickens. I was too preoccupied with art, drawing and painting, however, and that took precedence. A: I am currently reading The Storyteller by Jodi Picoult. She is my favorite author and truly a master at what she does. I am learning from reading her. For example I have learned that I need to up my game and provide more plot twists and turns. Q: What was the inspiration to write Four Letters? A: Unfortunately, the inspiration for Four Letters was a wedding in my own family, where my youngest daughter got left out. I have five children, and after that wedding, two of my children didn’t speak to me for a while. I was driving school bus at the time with too much time to think. I started a journal but that didn’t help. Then I concocted this storyline, took it to extremes, and started writing this story. By writing a story about other characters, it kept my mind off of my own issues, and gave me something to focus on. Fortunately, after a short time, my family did come around, and everything worked itself out. But I decided to tell this tale to the extreme that I did as I wanted to get my message across about the importance of family. I suppose this message was one that I wanted to impress upon my own children at first. Needless to say, they are proud that I published a book, and for now, wish to avoid reading it like the plague needless to say! Q: Did you start with a detailed outline or simply make things up as you went along? Q: Your choice of narrator for this story – Ella’s caregiver, Janis, rather than Ella herself – was an interesting one. What governed this particular decision? A: From the beginning I pictured the opening scene where Janis is writing the letters for Ella. If I just told Ella’s story, it would not only make for a sad story, but a short one as well. Because Ella was the age she was, I felt I needed some young characters to weave a story around, as well as to lend some lighter moments to the story. So at times, it was very much like writing two stories in one. Perhaps, because of my own experiences, I needed to just get Ella’s story and feelings out in the open; however, I found that by telling Janis’s story and her up-and-down relationship with her only sister, my message about the importance of family would get across. In my own life, I felt that this message wasn’t received by my own family, so I was in a position to put that in a book and maybe influence others, just as Ella’s message wasn’t received by two of her own children, yet she was able to influence another family, namely Janis’. I felt that narrating this story from Ella herself would be too limiting, too sad and too concentrated upon the family rift. At the same time I wanted to get a message across. I felt that by having a secondary character, Janis, through her eyes, the reader would, like Janis, learn a lesson, one taught by an older, wiser generation. Q: How might this story have been different if told from the perspective of Ella or, for that matter, her offspring? A: This story would probably not take place in today’s world, but instead it would a story centered around the family rift as it happened in the seventies. There would be no other family to advise, however it would concentrate more on Ella herself as well as her children directly. Being told through Janis, the message of family is clear. Being told through Ella, the message of family would be too intense, like beating a dead horse, perhaps. This is a tragic story that I lightened by telling it through a stranger’s eyes. Q: What were some of the challenges of interweaving the two women’s respective family issues? A: Presenting two different families and their issues was complicated. In a sense there were two protagonists, with the emphasis on Janis vs. Ella. I had to be able to relate to a younger, twenty-something and thirty-something generation, with the issues that they would face today. I had to do this side by side with Ella, who grew up in a different world, and portray her values from that time period, which differs from today’s. Q: How much of the plot and characterizations in Four Letters are drawn from your own life or those of people you know? A: There is probably more plot and characterizations drawn from my own life and people that I know than I would care to admit to. The wedding scenario was based on my own experiences, the rest is fiction. I did, however, draw on some experiences in my own life. For example, the ice cream run was something that my father would sometimes do when I was little. I remember past summers, being young, going to bed, and being woken up to be taken out for ice cream in my pj’s. As far as drawing from people I know for some of my characters, I did picture someone for the role of Charlie, as the fishing buddy of Janis’ dad. It brought this character to life. The fishing stories he tells, however, are pure fiction…then again, aren’t fishing stories always fiction? Q: The premise of Ella’s story – the estrangement from her children and her desire to reunite with them – seems awfully sad. Won’t readers think that this is too much of a downer tragedy to add to their book list? A: Ella’s story of estrangement is really sad, which is another reason why I chose to narrate it from Janis’s perspective – a younger woman with her own family, including all the happiness, love and laughter one would expect to see, along with some hilarious situations at work, to balance the tragedy. Q: What are some of the lighter moments of the story? A: The break room scene in chapter three is a hoot. It is a lively discussion about bridezillas. You just have to read it. The antics of some of the residents where Janis works will make you chuckle. Q: What, ultimately, is the takeaway value you want readers to have by the final chapter? A: Bottom line, the message that I have been trying to impart is that all you really have in this world is family. It seems that in today’s society, everything is fast-paced, and based on instant, Internet communication, losing the personal touch, and family bonds seem to become more strained. Q: If Hollywood came calling to make a movie adaptation of Four Letters, who would comprise your dream cast for it? A: If this book were to be made into a Hollywood production, then I would love to see it directed by Clint Eastwood. I think it would be right down his alley as they say. I would trust him to come up with a killer cast. There was a movie called In Her Shoes, about two sisters. That casting would work here. And Betty White could be Ella! And by the way, my oldest daughter, Krystal, who is also on the cover, would most likely love to do some acting as well. She majored in theater in college. Q: Despite the popularity of e-publishing and the artistic control it affords today’s authors, why did you opt to go the traditional route? A: I did my homework regarding the publishing field. The general consensus was that there was more credibility publishing traditionally through a publisher as opposed to self-publishing. Here someone, in this case North Star Press, was willing to take a chance on this book, as opposed to my paying someone just to print it. A: I found North Star Press by taking a couple of publishing and writing courses that were offered through them. Each publisher seems to have something that they are looking for. North Star likes to publish new authors that have written about Minnesota, or the upper mid-west, which is why I set my story locally. Q: What surprised you the most about the publishing process that you didn’t know before? A: I expected to receive a little more advice and guidance from my publisher. I was surprised at how much editing and such that I was able to do. A: I had an idea in mind, and then I decided to use Janis and Joyce in this story. 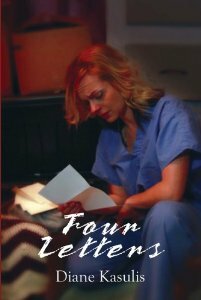 Originally, I wrote Four Letters as a stand-alone book. However, I am taking the story further (Ella’s is done) and concentrating on Joyce. This story is narrated by Joyce, and follows her through her shaky college experience, as well as her bitter, almost violent relationship with her ex-boyfriend Ty from the first book. A: Yes, I wish that the original synopsis for the back cover was what got placed there. It is on my website http://www.authordianek.com and went into the relationship between Ella and Janis. I was asked to also provide something short and snappy. This short paragraph only focuses on Ella. By reading this, one would assume this story may be a bit different than what it actually is. I think this also sells the story a bit short. There is a lot more to this story than what the back cover portrays, and is worth an extra look, or checking out my webpage.